Books on Tape (Random House Audio Publishing Group), 2006. Abridged. 6 hours, 8 minutes, 5 compact discs. I've been meaning to getting around to reading Obama's second book ever since I read Dreams from my Father. Finally, I decided to listen to it, even though our library only has the abridged version in audiobook form. Read by the author, it occurred to me that he is the first presidential candidate in a long time whose voice I can actually enjoy listening to for several hours! 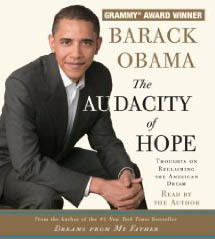 This book is still autobiographical, about Obama's life when entering politics. Along the way, he talks about all kinds of issues that face politicians in America today. My reaction? Wow! I am abundantly impressed with this man. I am impressed with his thinking about what politics should be and how politicians should serve the people of America. When Obama was running for state legislature, he talked to people from all over the state, in all walks of life. I feel like he gets it, he understands what people want, what people are concerned about, what they want government to do for them. I like the way he talks about the values that Americans share. Here's someone who can actually see the good in people who disagree with him. I liked the discussion of the Constitution. He has actually taught constitutional law. As President, he would not usurp the powers of the executive branch. He has respect for the Constitution that is refreshing to hear. But don't take my word for it. I highly recommend this book. If you want to know who is the real Barack Obama, I think you can learn much about him from hearing his thoughts on beginning a life in politics. Here is someone who truly seems to have entered politics in order to serve.